This is what I work with in the microbiology lab. On the left is uninoculated minimal media (clear), in the center is a resuspended overnight culture of Escherichia coli not expressing green fluorescent protein (GFP), and on the right is a culture of E. coli that's busy expressing lots of GFP. These are in glass test tubes under UV light. Both of the cultures in the two right tubes have a plasmid that produces GFP under the control of arabinose (a kind of sugar). The fluorescing culture was incubated overnight with 0.2% arabinose and the center tube received none. 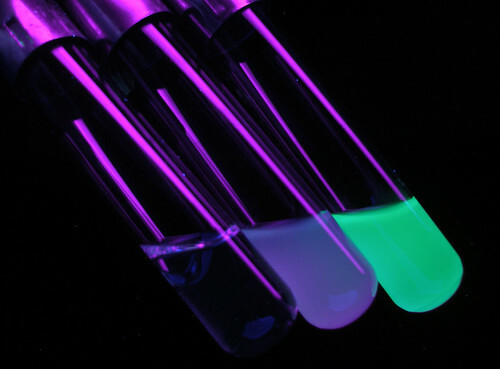 GFP was isolated from the jellyfish Aequorea victoria and is now widely used as a fluorescent marker in molecular biology. We use a particular mutant form of it to measure cytoplasmic pH of bacteria growing at low external pH.